Eranos is an East-West research center founded in 1933 by Olga Froebe-Kapteyn, an energetic and intuitive Dutch woman, who turned the house her father had given her on the shore of Lago Maggiore, in the Canton Ticino, Switzerland, into a haven for artists, scientists, researchers and a major crossroad for European intellectuals throughout the central decades of the 20th century. The location and premises are exquisitely charming: three old houses on the steep sloped lakeshore (the 18th century original house, Casa Gabriella, and two houses that Olga had built, Casa Eranos and Casa Shanti), surrounded by tall trees and flower beds, in a maze of stone stairways meandering paths. I have been involved in running the Eranos conferences from 1994 till 2002, together with Rudolf Ritsema, the Dutch scholar and sinologist who succeeded Olga at the helm of Eranos in 1962, and Christa Robinson, the Zürich Jungian analyst who became president of the Eranos Foundation in the ’90s. The last of the Eranos Round Table Sessions took place in November 2002 with the title Beyond Consolidated Forms: Emergence of Change. After four years of inactivity, during which time the Eranos Foundation underwent profound changes and had to resolve serious financial troubles, the ‘new Eranos’ resumed its activities in June 2006. At present (October 2012) the Eranos Foundation is presided by the philosopher Fabio Merlini and entertains close collaboration links with the Fetzer Institute and with the Pacifica Graduate Institute. For information about current activities at Eranos see the Eranos Foundation website. The comparative approach of Eranos, situated in the heart of Europe, at the crossroads of the German, French and Italian cultures, has always sought to recover the meaning of Western civilization, lost in the often dangerous bogs of a secularized ethnocentrism. Eranos is one of those privileged places where one can become aware of the true dimensions of culture… And no culture is possible without an intense work aimed at integrating the achievements of various research fields in a unitary perspective. The name Eranos has been the program of fifty five years of conferences. This openness should not be limited by a declaration of purpose or by an institutionalized organization. The topic of each encounter has not been conceived as a program, but as a crystallizing agent for the contributions of the various speakers. Neither the individual speakers nor the Eranos work as a whole have ever sought to formulate specific conclusions, but rather to open up further glimpses in many directions. Olga and Jung always felt that an ‘unknown spirit of the place’ was the real creative force behind the Eranos endeavor. 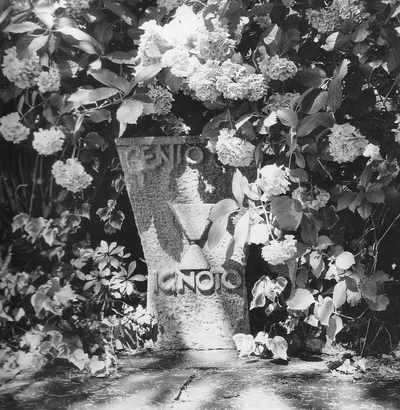 This little stone altar stands on the terrace of Casa Gabriella at Eranos.